The transversus abdominis plane (TAP) exists between the internal oblique and transversus abdominis muscles, and encompasses an intersected plexus of nerves. The TAP block has been the subject of multiple clinical trials to determine its analgesic efficacy. A total of 60 patients were randomized into one of two groups: TAP block group (group 1) or no-TAP block group (group 2). All patients underwent a standardized anesthetic technique. The TAP block group received preincisional ultrasound-guided TAP block on the side of surgery with a 20-ml volume of 0.5% of bupivacaine, and the no-TAP group received equivalent amounts of saline. A standardized postoperative analgesic regimen composed of intravenous paracetamol and a morphine patient-controlled analgesia (PCA). The amounts of intraoperative fentanyl and post-anesthesia care unit (PACU) morphine and PCA-administered morphine, pain scores, as well as number of patients experienced postoperative nausea and vomiting in the ward at 6 and 24 h were recorded. 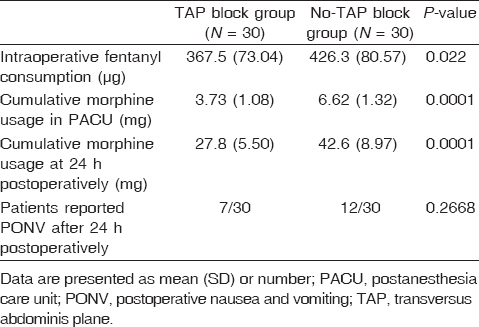 TAP block group patients received a significantly lower cumulative intraoperative fentanyl, significantly less boluses of morphine in postanesthesia care unit, and significantly lower cumulative 24-h postoperative morphine dosage than the no-TAP block patients. Pain visual analog scale scores were significantly lower at both 6 and 24 h postoperatively in the TAP group when compared with the no-TAP group. There were no complications related to the TAP block procedures. No signs or symptoms of local anesthetic systemic toxicity were detected. On the basis of our current results, preincisional ultrasound-guided TAP blocks confer analgesic benefit when added to the multimodel analgesia regimen during and after kidney transplantation. Anesthesia for kidney transplantation recipients is challenging to anesthetists because of associated comorbidities in transplant recipients, including hypertension and diabetes mellitus. Postoperative pain after renal transplantation may be severe, and the administration of systemic analgesia may be restricted because of impaired renal function and respiratory complications from opioids , . The challenge increases because of altered pharmacokinetics of many drugs, including opioids, and therefore the use of morphine to control postoperative pain after renal transplantation must be monitored closely as the clearance of its active metabolite morphine-6-glucuronide is reduced by renal impairment, resulting in its accumulation  . Moreover, owing to the potential platelet dysfunction in these patients, the use of epidural anesthesia for renal transplantation remains debatable  . Therefore, in many transplant centers, intravenous opioid administration remains the mainstay of analgesia after renal transplantation, even though significant accumulation of morphine-6-glucuronide has been observed in transplant patients, despite sufficient primary graft function stopping the need for dialysis after transplantation  . We hypothesized that a preincisional transversus abdominis plane (TAP) block may provide better intraoperative analgesia and less pain for the first 24 h postoperative, reduce opioid consumption, and postoperative nausea and vomiting (PONV) as an opioid side effect in patients undergoing kidney transplant. After local medical ethics review board approval, 60 patients scheduled for cadaveric or living donor kidney transplantation were enrolled in this study. This study was conducted at King Abdul-Aziz Medical City from the period of January 2012 to September 2013. Eligible patients were recruited after getting written, informed consents. Patients were excluded if they had any contraindication for a TAP block, any known allergy for bupivacaine, physical, or mental conditions which may be vague, measuring postoperative pain after surgery. Patients with morbid obesity (BMI≥40) were also excluded. Patients were randomized into one of two groups: TAP block group (group 1) or no-TAP block group (group 2). All patients received a standardized anesthetic technique for induction with 100-200 μg fentanyl, 2-3 mg/kg propofol, and 0.15 mg/kg cisatracurium. Maintenance was achieved with oxygen/air sevoflurane and intraoperative titration of intravenous fentanyl, according to the decision of the attending anesthetist's evaluation. Randomization was done by serially numbered, sealed, opaque envelopes concealing the randomization group as determined by a computer-generated random numbers table. Group 1 received preincisional ultrasound-guided TAP block on the side of surgery with a 20-ml volume of bupivacaine 0.5%, and group 2 received equivalent amounts of saline. Pre-incisional ultrasound-guided TAP blocks were performed by one of the authors with significant previous experience in ultrasound-guided techniques and after that he was not involved in management of the case or collection of the studied data. After aseptic preparation of the injection site, an ultrasound transducer (linear 6-13 MHz, SonoSite M-Turbo®, Bothell, WA, USA) (covered with sterile sheath) was positioned transversely midway between the iliac crest and the costal margin at level of midaxillary line. Using a real-time image, a 22-G 10-mm insulated needle (Stimuplex A; B-Braun Medical, Melsungen, Germany) was introduced anteriorly and in the plane of the ultrasound beam until its tip was between the internal oblique and transverse abdominal muscles. After negative aspiration, 20 ml of either bupivacaine 0.5% or normal saline was injected. Distribution of the injectate between the internal oblique and transverse abdominal muscles was observed. Incision was standardized in all patients as an oblique incision made in the lower right quadrant of the abdomen. Antiemetic regimen consisted of 8 mg dexamethasone administered intravenously at the induction and 4 mg ondansetron administered intravenously at the completion of surgery. All patients were managed postoperatively within the postanesthesia care unit (PACU), where patients were administered boluses of intravenous morphine by PACU nurses, when needed, as 2 mg boluses every 5 min if pain score was equal to or more than 5, with a maximum dose of 10 mg. In the ward, postoperative analgesic regimen composed of 6 h intravenous paracetamol (1 g) and a morphine patient-controlled analgesia-delivering bolus of 1 mg, 6-min lockout, and maximum 4 h dose limit of 25 mg. The use of intraoperative fentanyl, patient-controlled analgesia-administered morphine boluses, and the number of patients experienced PONV, as well as pain scores at 6 and 24 h following completion of surgery, were recorded. Patient-reported pain scores were assessed with a visual analog scale ranging from 0 to 10, with 0 denoting no pain, and 10 denoting the maximal pain imaginable. Categorical data were expressed as n (%) and compared using a χ2 -test or Fisher's exact test as appropriate. Continuous data with a parametric distribution were presented with mean and SD and compared using an independent t-test, whereas nonparametric data were expressed as median and interquartile range and compared with a Mann - Whitney U-test. A result was deemed significant when P-value was less than 0.05. On the basis of previous published data, we hypothesized a 40% reduction in morphine usage from TAP block administration to 24 h following surgery  . We calculated that less than 30 patients were required in each group to give 80% power at a 5% significance level. A total of 60 patients were recruited into the trial. There were no significant differences in demographic or operative data ([Table 1]). Group 1 patients received a lower cumulative intraoperative fentanyl dose of 367.5 ± 73.04 µg than group 2 patients who received the same at 426.3 ± 80.57 µg, with a statistically significant P-value of 0.022. In the PACU, group 1 patients needed smaller amounts of morphine (3.73 ± 1.08 mg) than the group 2 patients, who needed 6.62 ± 1.32 mg, with a statistically significant P-value of less than 0.0001. In addition, group 1 patients needed a lower cumulative 24-h postoperative morphine dosage (27.8 ± 5.50 mg) than the group 2 patients, who used 42.6 ± 8.97 mg, with a statistically significant P-value of less than 0.0001 ([Table 2]). The total number of patients who reported with PONV at 24 h following surgery was seven (23.3%) in the TAP block group compared with the 12 (40%) subjects in the control group; however, it was statistically nonsignificant ([Table 2]). Pain visual analog scale scores were significantly lower at both 6 and 24 h postoperatively in group 1 than in group 2 ([Figure 1]). There were no complications related to the TAP block procedures. No signs or symptoms of local anesthetic systemic toxicity were detected. Figure 1: Mean postoperative visual analog scale (VAS) pain scores at 6 and 24 h postoperatively in each group. Data are presented as median (interquartile range). *P is signifi cant at 6 and 24 h.
First described by Rafi  , the TAP block can be used as an analgesic supplement in procedures involving the abdominal wall and anterior parietal peritoneum  . The TAP exists between the internal oblique and transversus abdominis muscles and encompasses an interconnected plexus of nerves comprising the somatic afferents of T8-L1 , . The TAP block has been the subject of multiple clinical trials to determine its analgesic efficacy and repeatedly shown to be effective in reducing postoperative pain scores when used as part of a multimodal analgesic regime in both upper and lower abdominal surgery  . TAP block has been studied in many surgical procedures as open appendectomy, abdominoplasty with flank liposuction, total abdominal hysterectomy, and laparoscopic colorectal resections ,,, . Pain after kidney transplantation is thought to be multifactorial, including a parietal (or somatic) component originating from the surgical incision and a visceral component originating from the intra-abdominal structures. An optimal analgesic technique would block all noxious stimuli that result from surgical insult including parietal and visceral components. TAP block, acetaminophen, steroids, and opioids would control the parietal pain, whereas acetaminophen and steroids would control the visceral pain. Epidural anesthesia may be optimal to control both parietal and visceral components; however, in our study on patient population, epidural block is controversial because of potential coagulopathy status  . 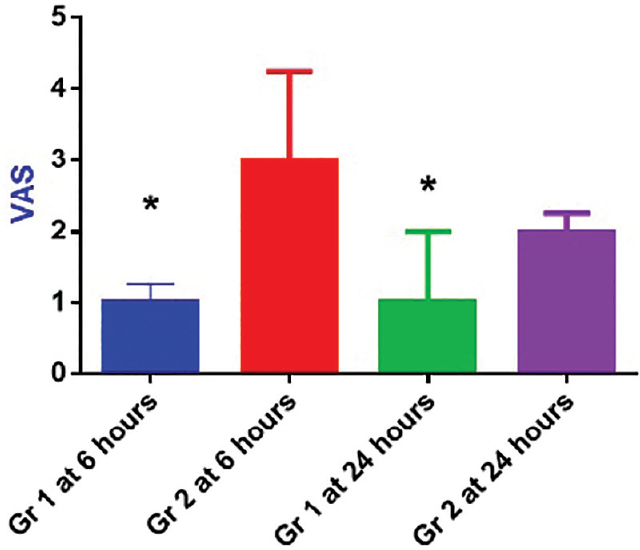 This trial demonstrated a significant reduction in intraoperative and cumulative opioids dosage used over 24 h by patients treated with TAP blocks compared with those who did not. Our observations can be explained by the fact that TAP blocks may reduce the parietal pain from the skin and muscles, but it does not influence the visceral pain that is conveyed by the autonomic nervous system. Soltani Mohammadi et al. studied the efficacy of TAP block for acute postoperative pain relief in kidney recipient. In this study, they used 15 ml of 0.25% bupivacaine plus 5 µg/ml epinephrine for the TAP block. Consistently with our results, they concluded that ultrasound TAP block can reduce postrenal transplantation pain and the amount of opioid consumption intraoperatively and during the first 24 h after surgery in kidney recipients. Our results are inconsistent with the findings of Freir et al. 17 who concluded from their prospective randomized study that the addition of a TAP block to the analgesia regimen for patients undergoing cadaveric renal transplantation did not confer any additional benefit on opioid requirements or pain scores in the first 24 h postoperatively and was associated with no appreciable patient benefits. These differences may be attributed to lack of ultrasound guidance with lack of testing for sensory block in TAP patients in the study of Freir and colleagues. Use of an ultrasound-guided technique may have improved TAP block success rate and/or dermatomal spread. The reduction in cumulative morphine usage reported in TAP block group would be expected to translate to improved clinical outcomes through reductions in opioid-associated side effects, as less number of patients experienced PONV in the TAP block group. In conclusion, based on our current results, preincisional ultrasound-guided TAP block confers analgesic benefit when added to the multimodel analgesia regimen following kidney transplantation with decreased intraoperative opioid consumption. Ghods AJ, Mahdavi M. Organ transplantation in Iran. Saudi J Kidney Dis Transpl 2007; 18:648-655. Dean M. Opioids in renal failure and dialysis patients. J Pain Symptom Manag 2004; 28:497-504. Stein C, Schafer M, Machelska H. Why is morphine not the ultimate analgesic and what can we do to improve it? J Pain 2000; 1:51-56. Akpek E, Kayhan Z, Kaya H, Candan S, Haberal M. Epidural anesthesia for renal transplantation: a preliminary report. Transplant Proc 1999; 31:3149-3150. Carr AC, Stone PA, Serpell MG, et al. Patient-controlled morphine analgesia (PCA morphine) in cadaveric renal transplant recipients: does morphine-6-glucuronide accumulate? Br J Anaesth 1998; 81:630P. Albrecht E, Kirkham KR, Endersby RV, Chan VW, Jackson T, Okrainec A, et al. Ultrasound-guided transversus abdominis plane (TAP) block for laparoscopic gastric-bypass surgery: a prospective randomized controlled double-blinded trial. Obes Surg 2013; 23:1309-1314. Abrahams MS, Horn JL, Noles LM, Aziz MF. Evidence-based medicine: ultrasound guidance for truncal blocks. Reg Anesth Pain Med 2010; 35 (Suppl):S36-S42. Jankovic Z, du Feu F, McConnell P. An anatomical study of the transverse abdominis plane block: location of the lumbar triangle of Petit and adjacent nerves. Anesth Analg 2009; 109:981-985. McDonnell J, O'Donnell B, Farrell T. Transverese abdominis plane block: a cadaveric and radiological evaluation. Reg Anesth Pain Med 2007; 32:399-404. McDonnell JG, O'Donnell B, Curley G, Heffernan A, Power C, Laffey JG. The analgesic efficacy of transversus abdominis plane block after abdominal surgery: a prospective randomized controlled trial. Anesth Analg 2007; 104:193-197. Niraj G, Searle A, Mathews M, Misra V, Baban M, Kiani S, Wong M. Analgesic efficacy of ultrasound-guided transversus abdominis plane block in patients undergoing open appendicectomy. Br J Anaesth 2009; 103:601-605. Araco A, Pooney J, Araco F, Gravante G. Transversus abdominis plane block reduces the analgesic requirements after abdominoplasty with flank liposuction. Ann Plast Surg 2010; 65:385-388. Carney J, McDonnell JG, Ochana A, Bhinder R, Laffey JG. The transversus abdominis plane block provides effective postoperative analgesia in patients undergoing total abdominal hysterectomy. Anesth Analg 2008; 107:2056-2060. Conaghan P, Maxwell-Armstrong C, Bedforth N, Gornall C, Baxendale B, Hong LL, et al. Efficacy of transversus abdominis plane blocks in laparoscopic colorectal resections. Surg Endosc 2010; 24:2480-2484. Soltani Mohammadi S, Dabir A, Shoeibi G. Efficacy of transversus abdominis plane block for acute postoperative pain relief in kidney recipients: a double-blinded clinical trial. Pain Med 2014; 15: 460-464. Freir NM, Murphy C, Mugawar M, Linnane A, Cunningham AJ. Transversus abdominis plane block for analgesia in renal transplantation: a randomized controlled trial. Anesth Analg 2012; 115:953-957.